SHIMobile is a new application for mobile devices that allows users to collect important natural resource information in the field. SHIMobile makes field data collection easy and will help users collect and update sensitive habitat inventory using standardized SHIM methods. The application is suitable for use on mobile devices equipped with GPS and a camera and can be used offline. SHIMobile enables practitioners to record important attributes about stream and riparian features using a common data dictionary. After field data is collected it can be added to a structured on-line data base and web mapping application, the SHIM Atlas on the Community Mapping Network. SHIMobile can be used to compliment or update existing SHIM data, enabling more efficient and cost effective field observations of stream features. Accurate stream centre line mapping still requires a high end GPS capable of +or- 5m accuracy but stream attributes can be recorded using the less accurate GPS in modern mobile devices. SHIMobile Forms – HanDBase version is an iOS compatible set of data forms and CMN plans to also publish the same data forms in an Android compatible format. The structure of SHIMobile data forms is available as an Excel woorkbook in the “Atlas Documents” section below. The field names, data types and menu options can be seen in “SHIMobile structure.xls“. Why was HanDBase chosen for SHIMobile? HanDBase is a database authoring application with versions that work on many different mobile devices and Mac or PC desktop computers. This makes data forms sharable across devices and all versions export data in one standard format. This also means data form design can be done once and used on different mobile devices. Data form design (scripting) is done on the mobile device using HanDBase and then the forms are “run” using HandBase. Once HanDBase is installed on a device that one app can be used for many different forms and many different inventory methods, SHIM, Wetlands are two examples. Those are the pros for using HanDBase and on the cons side: HanDBase only captures point locations (currently), and the photos taken using data forms have to be uploaded seperate from the attribute data. There are some other limitations but those are the main ones and there are ways to “work around” those limitations (discussed later on). Limitations of GPS on a mobile devices: Most mobile devices (phones & tablets) have GPS receivers and the newer ones receive location data from the US and Russian GPS satellites. The more satellites that are in view means the device will determine a location more quickly and drop out less often but the spatial accuracy is basically +/- 10 meters under ideal receiving conditions. When you are under forest canopy or in ravines the location accuracy can be much less. 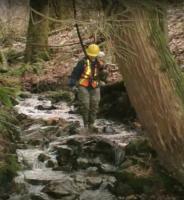 That is why we say above that the stream centre line requires a “high end” or survey grade GPS receiver. Since SHIM started (pre 2000) Trimble GPS receivers combined with post processing have been used to locate stream centre lines to +/- 5 meters. After a stream centre line is mapped to +/- 5 meters the various stream & riparian features can be located by a less accurate GPS. SHIM Methods (2002) can be referenced for all field methods that apply to using SHIMobile, specificly Module 3 “Watercourse Centerline and Habitat Feature Mapping”. SHIMobile has been made possible by funding from the MEC Capacity Building Grant.